For all of the frolics in the rainy Malaysian Grand Prix qualifying last weekend, for me one matter stood apart from all others. Alonso's fourth place result from the session was impressive enough in itself, but was especially so when the effort was placed within its full context. He and Daniil Kvyat had come into contact early in Q2, which among things snapped a wishbone on Alonso's Ferrari's front suspension. Everyone thought that would be that for Nando, but the Ferrari mechanics displayed breathtaking speed of fingerwork and almost unbelievably Alonso was back out circulating long before the session was over. Alonso perhaps is being humble. There are plenty of modern-day F1 drivers - some of them excellent ones; race winners; perhaps even the odd world champion - whose lap times grow almost beyond recognition if the thing underneath them isn't just so. Rarely do such considerations impede Alonso however; by contrast it seems almost that the more adversity you throw at him the better he does. You could argue that none of Alonso's contemporaries would have got the askew Ferrari to where the Spaniard did in Malaysia's qualifying session. And it's no one-off; there are a variety of examples of these skills from Alonso's past. To take one, if we rewind back to the race at the same venue in 2010 then, starting low down in 19th after missing the best of the weather in rainy qualifying, Alonso on the warm-up lap sensed a problem. His gearbox started to play up and from then on he had no clutch. And for the remainder of the race when downshifting he had to blip the throttle instead. 'I had first to shift down a gear, then press the throttle hard so that it would engage the specific gear for a corner' said Alonso. 'So it was probably the hardest race of my whole life'. But still Alonso fought, and was able to run in the company of the likes of his team mate Felipe Massa as well as with Jenson Button's McLaren for the duration; indeed had he been able to clear them in these pre-DRS days (and remember his problem made it much harder to out-brake anyone) the likelihood is that he would have pulled away. Still, and after employing a tyre strategy that didn't work due to waiting for rain that never came, Alonso was on for points only to be halted by an engine failure with two laps left. But all was not lost for Alonso. This was but race three of his Ferrari career, and just a week on from the Australian race wherein he reckoned he could have won from the back had Massa been cleared out of the way at a vital moment (and he told the team as much). The day of his Malaysian effort was apparently the day that convinced Ferrari to get aboard the Alonso train. Rewind back further to another qualifying session, this time in late 2006, and Alonso was battling for the drivers' title against a resurgent Michael Schumacher in the Ferrari on the Scuderia's home patch at Monza. Partway through the final part of qualifying, and with no competitive times set, a rear tyre on Alonso's Renault punctured, and Alonso had to do close to a full lap on a three-wheeled machine in order to have it changed. He returned to the action with severely damaged rear bodywork and aerodynamics, resultant of his hobbled lap, and uncertain grip underneath him. Perhaps worst of all it left him with no mark set and next to no time to spare so to do. Alonso did a breakneck out lap in order to get to the line before the chequered flag fell, which he made by a whole two seconds... He also had to - on the fastest track on the calendar - put all thoughts of punctures and a damaged car into a mental recess. With all of these uncertainties swirling, and this his only chance to get it right, his subsequent lap time was good enough for fifth place on the grid. It was by consensus the lap of the season; one that Nigel Roebuck watching on described as 'stupefying'. However it counted for nothing as the stewards, fatuously, decided that in Alonso's frenetic out lap he impeded the Ferrari of Felipe Massa, even though few observers thought there was much impediment going on as Massa had barely got within 100 metres of him at any point (ironic too given Ferrari has in recent Monza qualifying sessions sought to do this deliberately with its two cars in order to benefit from a slipstream). Down came the gaffle and Alonso lost his three best times, sinking him to tenth. Niki Lauda called it 'the most ridiculous thing I've ever seen in F1', and think of the ridiculous things that Niki's seen. 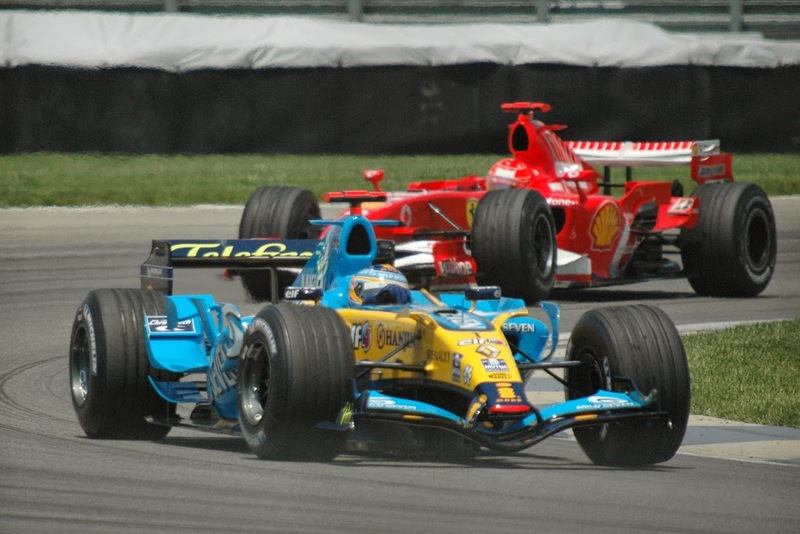 We can go back even further too to the British Grand Prix of 2003, wherein partway through the race Alonso's electronic gizmos - this being the age of de rigueur traction control and the like - went on the blink, and Alonso continued to set roughly the same laps times as before. 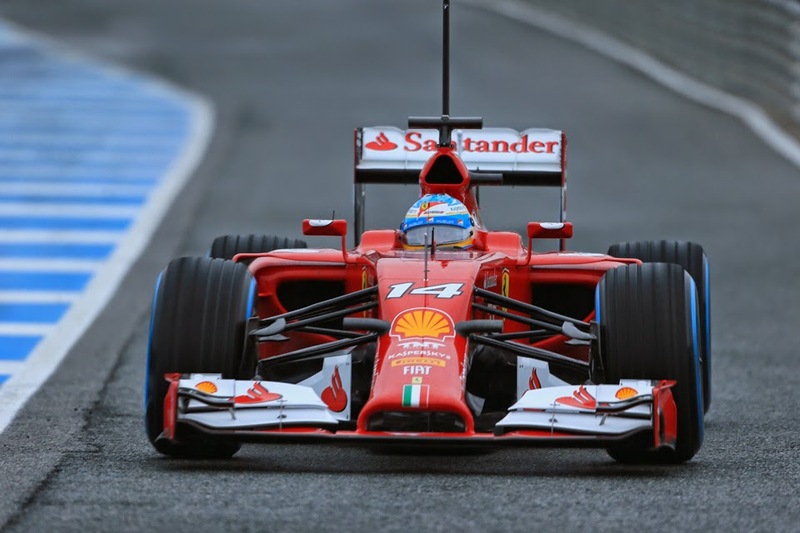 Alonso it appears is modern F1's improvisor supreme. Lewis Hamilton - Boy II Man?